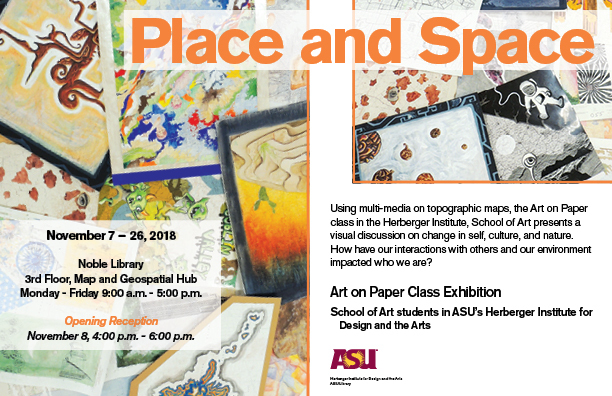 Cartographic exhibits featuring artworks by Herberger School of Art students and hosted by the ASU Library Map and Geospatial Hub. For this piece, I wanted to capture the beauty of the topography within the maps provided. I highlighted the topography with a low topography relief. For my space piece, I wanted use the natural beauty of the map once again. I used the topography lines to act as constellation lines in space. To highlight the use of place, I chose Cimarron Peak as the focal point of the piece. To more properly use the map space, I used the off-shooting “islands” and the black outline to lead the viewer’s eyes to Cimarron Peak. For the topic of space, I outlined different mountains and extended the edges to make them appear as if they were moving upwards. To further accentuate space, I layered the mountains behind each other creating a sense of depth. This piece describes all the places and cultures that run through my blood. Since my mom is from India, and my dad is from Pakistan, I mixed their backgrounds with my own as an American. I wanted to outline the specific cities my parents were born and raised in, leading up to the city I was born in. I ended up mixing the roadwork from New Delhi, Lahore, and Pasadena and the idea was to use all these spaces all leading up to the one place I was born: Pasadena. Place evolves from space that has been molded around our identities. A mountain at sunset begins as general, unidentified space, but it can unknowingly become a place called home. The process of creation begins at amorphous, unidentified space. We use the pieces available to puzzle out the unknown identity of an empty space. These green creatures roam their home of Goblin Valley protecting it from unwanted visitors. While they may be small they can unleash a major temper especially when they become hangry. Inspired by the Mars Desert Research Station (MDRS) located in Hanksville, Utah. 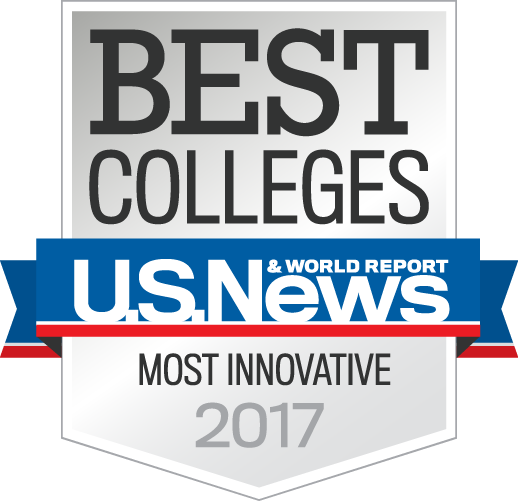 The MDRS allows scientists, engineers and students to explore a simulation of research on Mars. The Cacao tree also known as the “Theobroma” and carries a special place in my heart because the Cacao is known as a sacred tree that played an essential role in the creation story of my ancestors. Additionally, the map I used reminds me that I have an installed mural for display at a restaurant called Chocolatetree in Coconino National Forest. In this painting, you will see my modern ancestral imagery as sphere heads with the use of different texture and depth on the faces, ultimately giving the viewer the illusion of space between each head and the viewer. The location of this map reminds me of my daily commute to school as I settle into my headspace reaching my next destination with peace and creativity. The eye hides from the viewer while also confronting them, looking directly out at the person peering into the place where she hides. Society has taught her that she must shy away from what it means to be a woman, so she only reveals a small part of herself. She puckers her lips from behind the piece to blow air out at the viewer. She feels threatened and invaded, and wants to ward off those who get too close. I am a person of mixed ethnicity and as such, I have a difficult time feeling as though I belong anywhere geographically. The ambiguity of this piece is one that is reflected in those who also feel like they don’t have a cultural home. I have an over-active mind and try to find ways to calm my thoughts, but living in a hectic environment isn’t conducive to blissfulness. Changing my location is the best way to change my headspace, the calmer the environment, the calmer my frame of mind. The piece studies the structure and architecture of the Empire State Building. This 1,545-foot tall building signifies the most iconic place in New York City. This piece explores the idea of abstraction in landscape. It compares and contrasts the harsh difference between the space of the building itself and the surrounding optical illusion. Map, watercolor paper, watercolor, pen, and thread. I grew up in Arizona, surrounded by desert wildlife. Sandstone reflects my adoration for the stones, dust, and grit native to the Southwest, the nature of their textures, and the prehistoric formations they create. Map, watercolor paper, watercolor, pen, graphite, charcoal, thread. Framework is my attempt to answer a persistent existential question of “What am I to the universe?” I seek support of all types throughout my existence, and Framework is my reflection of the realities, falsities and possibilities in space, time, form and function within life. This is a representation from my imagination of a huge mountain and buildings. I want to show how the natural shape of an island can become a landscape by using transparent media like watercolor. This is the story in my head when I looked at this map: two witches are stealing the star, and there is another magical creature that resides in the clouds. That dramatic representation makes us imagine what is happening. My initial idea was inspired by a traditional Korean painting containing the ten symbols of longevity. I created a nonexistent world with ten symbols by my own understandings of the Korean painting. Also, I depicted a dream of the night, which my families are flying or swimming freely in the dream. The usage of contemporary media and utilizing the lines drawn on the original map shows my own interpretations.